Midland Doctors has been humbled by the generosity and support that has been given over the years by so many individuals and organisations, only a small proportion of which are listed below. May2018 : On 20th May between 12pm and 9:10pm we did a Charity Appeal on Radio Ikhlas 107.8fm. Through the kind donations and support we have raised an amazing £36,146.18. 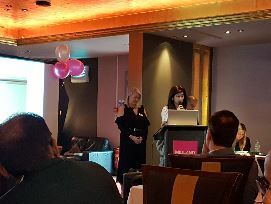 May 2018 : On Saturday 5th May Midland Doctors held its annual London Charity Event at the Radisson Blu, Portman Hotel. Through the kind donations and support from all who attended we managed to raise an incredible £130,000!! (Inc Gift Aid). Apr 2018 : On Sunday 15th April Midland Doctors held its annual Derby Charity Event at Anoki restaurant, Burton-on-Trent. Through the kind donations and support from all who attended we managed to raise an incredible £100,000!! (Inc Gift Aid) We would like to thank all our kind supporters who attended our event for their generous donations and support. A big thank you also goes to Anoki restaurant for their continued support of this fantastic event. Feb 2018 : We would like to thank Canadian Global Care for kindly donating a vehicle to the hospital in Muzaffarabad.Canadian Global Care is a non profit registered charitable organization. The Canadian Global Care Society is a grass roots organization focused on improving the health and well being of under privileged populations within Canada and around the world. Their goals complement ours and they continue to work hard to support Midland Doctors Association. May 2017 : On Saturday 6th May Midland Doctors held its Annual Fundraising Gala Dinner at the Hilton London Metropole Hotel.Through the kind donations and support from all who attended we managed to raise over £45,000! We would like to thank all our kind supporters who attended our event for their generous donations and support. Apr 2017: Derby Charity Event Raises £65,000! On Sunday 9th April Midland Doctors held its annual Derby Charity Event at Anoki restaurant, Burton-on-Trent. Through the kind donations and support from all who attended we managed to raise an incredible £65,000!!. A big thank you to Anoki restaurant and also to Clarins and Kiki’s Boutique for donating giveways. March 2017: We would like to thank a very special little boy, 6 year old Shayaan, who donated all his Birthday money to the Midland Doctors Association.Here’s the card he sent to us. Jul 2016 : An outstanding £32,200 was raised during our recent Radio Ikhlas Appeal.As a result of the success of the appeal an eye camp will be held later this year, which will be solely funded by the donations received during the Radio Ikhlas Campaign. Jun 2016 : The annual Derby fundraiser was this year held at the Viceroy restaurant in Duffield on Sunday 22nd May 2016.For those of you who were lucky enough to attend, you will know what a fantastic afternoon it was and with the help and generosity of all those involved, an outstanding £76,281 was raised! The event exceeded all expectations and was thoroughly enjoyed by all. 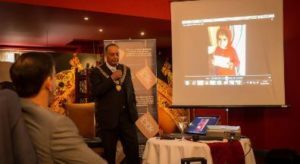 April 2016 : On Sunday 17th April we held another fundraiser, this time in Bradford at the Royal Taj restaurant.The Telegraph and Argus article written about our event is available below. We are extremely grateful for all those who attended and enabled us to raise an incredible £17,530!! Nov 2015 Mr Iqbal Soomro, a medicine producer and wholesaler, kindly agreed to donate medicine worth Rs 2 million.Rotary Club of Karachi Sunset Millennium for helping us with matching grant for the purchase of an autoclave for our theatre. 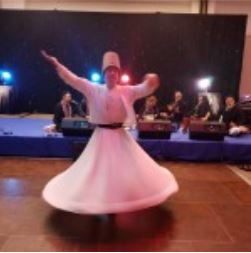 Sep 2015 : our Fundraising Gala Dinner and Musical Event in London took place. Through the kind donations and support from all who attended we managed to raise an incredible £108,000!! 3rd May 2015 Anoki Fundraiser. At todays fundraiser in the luxurious venue of Anoki in Derby the Midland Doctors team raised £ 130,000 with 100 people in attendance.Thanks to Mayor Shiraz Khan for his support, to Ajaz and Toni for running an amazing event and to the rest of the Midland Doctors team. 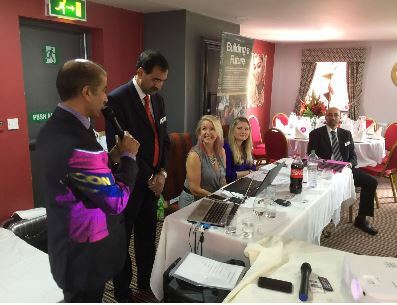 Sep 2014 : MDAUK raised a staggering £60k for our Hospital facility in North Kashmir at our Annual Charity Dinner at the beautiful surroundings ofGoosedale Banqueting Centre in Papplewick, Nottingham. Huge thanks goes to our generous supporters and benefactors who gave more than we ever expected. MDAUK University of Nottingham Medical Students donated £7k, Nottingham Alliance Cricket Club donated £3k, Sheraz Jenjua also donated £3k, Hafiz Shahid Hamid Kindly donated £2.4K, Imran Sakawat donated £2.5K, Iqbal Brothers Poultry gave £2k and Pak Foods donated £2K. This accompanied many other donations and pledges from the 370 that attended. Sep 2014 : Dr Irfan Wahedna has far exceeded his £2000 target for Midland Doctors Associations by running the Derby half marathon on June 8. These funds will go towards running our new x-ray suite and pharmacy. Dr Wahedna completed the run, on a very hot Saturday in the grounds of Elvaston Castle, clocking in a fantastic time of just under 3 hours. He had been training very hard over the last few months and we are so very grateful for his efforts. Sep 2014 : We are very grateful to Shabbir Mughal and friends from Sheffield/Rotherham for inviting us to the Eid Milan party held on 29th October 06 at Oriental Express Restaurant to raise funds for the proposed MDAUK hospital project.MDAUK has received a generious donation of £5,169.30 on the night. Sep 2014 : The MDAUK board of trustees would like to give special thanks toTelecom Midlands Limited, based in Burton Upon Trent, for their generous donation of Telecoms equipment to the value of $18,575.00 for Our NHS inspired hospital in Pakistan. Mr David Cottier, Managing Director at TML supplied a NEC digital telephone system with 60 handsets and associated accessories, which will prove vital in supporting the infrastructure of the hospital. TML are one of 5% of Companies in the telecoms Industry operating to the certification ISO 9002/2000. They are also corporate members of the Telecommunications Industry Association and fully compliant with OFTEL regulations. Their branches are located in the Midlands, with Engineering Support available nationwide from our network of local engineers. Out of a thousand or so clients they serve the needs of businesses large and small which include household name retailers, local Councils and numerous small, medium and large business organisations. Sep 2014 : The MDAUK board of trustees would like to give special thanks to Tanweer Arif who has arrange the generous donation of a PACS loaded server and software supplied by Pukka-j, a UK based, specialist medical technology company. 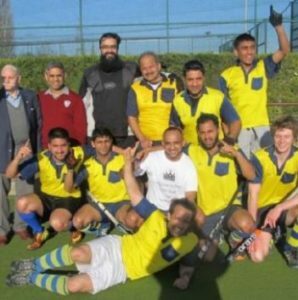 Tanweer Arif and his family, through arranging the donation, have provided a strong IT base for the MDAUK hospital in Pakistan. 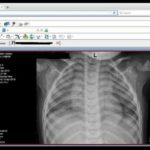 Without a robust IT and communication system to handle medical data, the hospital infrastructure would lack organisation and process. The server and equipment will be installed shortly on-site at the near-complete hospital site ready for the forthcoming inauguration in March 2013. May 2014 :Over £75,000 has been raised during a fabulous evening of fundraising at The Spot in Derby. The event was being held in memory of Mrs Irshad Begum, the mother of our Trustee Ajaz Najib, who passed away in 2013. 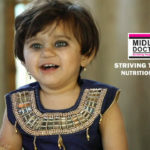 Mrs Irshad Begum was an advocate of the work of Midland Doctors and supported the charity both financially and through her belief in their principles. The charity is indebted to the support by key sponsors including: TMC catering, PAK Foods, M. Najib & Sons Limited, Day Night Pharmacy, Regal Bakery, McTurks Kebabs, Shahid Halal Poultry, The Carpet Stop, The Accounting House, Hill Langdell, Mercury Rent a Car, Derby Khidmah Group, Nottingham Cricket Alliance League, D.A.S, Anoki and LRS Claims. Sep 2012 : An excellent evening at Derby Pride Park organised by Derby Rotary Club have raised£15,000.A football shirt autgraphed by two English legends was auctioned for £1000. The Shirt was donated by Rupert Smilllie (Nottingham Probation Services) and Ms Ann Marie Thompson. 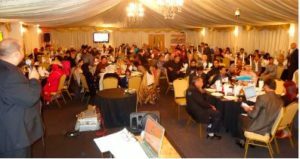 Mar 2012 : Midland Doctors raised a staggering £60k for our Hospital facility in North Kashmir at our Annual Charity Dinner at the beautiful surroundings of Goosedale Banqueting Centre in Papplewick, Nottingham. The event was organised with the kind help of Nottingham Alliance Cricket League and key sponsors of the event included Pak Foods, Najib and Sons, Choudhery Catering Nottingham, Ace Star Limos and many others. The event was fully sponsored for food, venue and entertainment and therefore 100% of the donations are going towards our project activities. Oct 2010 : A group of five bankers who together have raised a phenomenal amout in excess of £750,000 for the flood victims in Pakistan, have arrived to inspect how their funds are being spent. The group is made up of Abid Hussain (Citibank), Shahzad Amir (Nomura), Ivor O’Toole (Tullet Prebon), Iftikhar Ali (Millennium Capital Hedge Fund) and Sajjad Rashid (Bank of America Merrill Lynch). Oct 2010 : Joy Weise and Pat McGrath of the Nottingham Childrens Hospital have managed to collect equipment for the MDAUK hospital project worth in excess of £100,000.Najeeb and Sons have organised transportation of this equipment which includes 14 large physiotherapy couches estimated to cost £2000 each. 6th June 2010 Event at Anoki Restaurant Derby Raised £28,000. Other key sponsors of the event included McTurk, Meat Centre, Day and Night Pharmacy, Pak Foods. We would like to thank Anoki especially for leading on this event and supporting the effort. 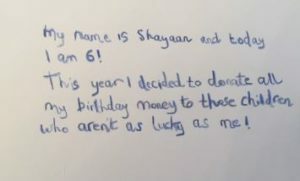 Jan 2010 : I was handed an donation of £50 today from my Children’s Dependency Nurses who raised the money by not sending out Xmas cards this year- very kind indeed. 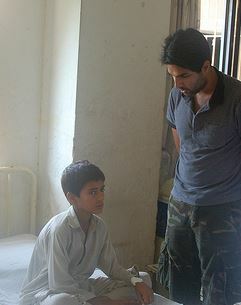 Dr Iftikhar also informs me that £500 was raised in a similar manner through the local donors. Jan 2010: This week I would particularly like to thank the team on PHDU for their kind support in raising money this last xmas. 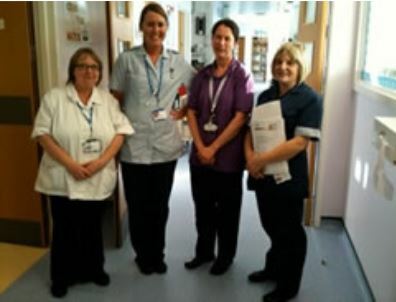 Thanks to Pat for maintaining the poster board at the PDHU and coordinating with Joy and the stores to secure donations of equipment that was being decommissioned from the NHS. Nurse Joy has been wonderful in her coordination and boxing of equipment for Pakistan. Jan 2010 : Thank you to Richard from Najib and Sons for donating his time today to collect trolleys and a couch for the hospital project. Ajaz of Najib and Sons had donated his staff, and van so that the equipment could be collected from Nottingham today. Ajaz, further at his own expense, has provided a container to house the equipment until the container can be shipped to Pakistan. Dec 2007: A fundraising dinner was organised by the mdauk sub-committee in Bradford on 4th December 07 at Bradford City Football Club. 600 people attended the charity dinner and raised a MEGA £160,000. This includes a cheque for £85,000 from Bradford Telegraph and Argus. 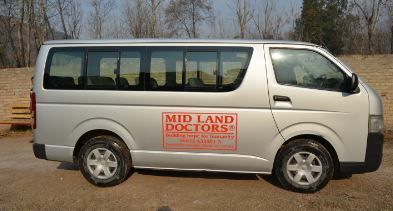 In 2014, a group representing people and companies who had donated very significantly to Midland Doctors visited Pakistan. The visit was following the devastating 2014 floods and the team were able to see how Midland Doctors delivered aid and also how Midland Doctors were progressing on the hospital project. Some of the comments from these donor representatives are shown below. Shahzad Amir: The team consists of myself, Iftikhar Ali (Ifti) of Millennium Capital hedge fund who also initiated this effort, Abid Hussain of Citibank, Sajjad Rashid of Bank of America Merril Lynch and Ivor O’ Toole of Tullet Prebon. So this was it. After 8-weeks of relentless fund raising for the Pakistan floods and reaching an astonishing figure of around £850,000, the day had to come to actually fly out there as we had promised to really make sure that the precious money raised actually reaches the right people and places. After checking-in to our hotel in downtown Karachi, I only had a couple of hours of rest time before getting underway with my first “to-do” task. 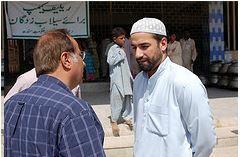 For the last 2 years, Nomura, which is the bank that I work for in London, had taken on the responsibility of running two schools in Karachi. So before setting off, I had promised them that I would pay a visit to one of the schools to check on its progress. The schools are run by an organisation called The Citizens Foundation (TCF), which has a network of around 650 schools throughout Pakistan that are run on donations from individuals as well as multi-national corporations from around the world. Their aim is to provide quality education for the underprivileged children from nursery all the way up to the age of 16. The school I visited was in the Hawks Bay area which is a small seaside town on the south-west coast. I was pleased to see that the school was well built, clean and very well maintained…Overall, I was very impressed by the schools management and TCF as an organisation for bringing education to the masses. Ivor O’Toole – I work as a Credit and Bond Broker in London in a comfortable world so far removed from the places that I have been brought to here. Before I arrived here I was overwhelmed by the contributions made by friends in the banking world, acquaintances, family and people who just happened to hear about what we are doing. You never want to underestimate things. It is always better to overestimate. Include in this the amount of work and money required to help the poor and disaster stricken people of Pakistan. On the hospital site we witnessed some of the site workers cutting steel rods – I said to Ifti Ali, “Measure twice – cut once!” If you really wanted to drive home your point you could add “Mistakes should be to overestimate”. We can always use more and not less – simple – but greed is when the need for more is overwhelming and to the detriment of others. I live in a comfortable world – I work hard for what I’ve got and I enjoy a nice life – but on the flip side I do try to help others and give a little back. Whether this is enough is not for any of us to judge – I think each individual will know by his own gut feeling. It would be an impossible experiment but try imagining putting one of the people that MDAUK is trying to help into Dr Ifti’s position – do you think he would do what Dr ifti does? I doubt it! It brings me back to estimation – I want you to overestimate the amount of work Dr Ifti does for charity and you still would be cutting the steel rod too short! Dr Iifti is the main driver behind MDAUK and a better person in this role they couldn’t wish for. He has been with us at every stage during our trip and a great and interesting host he is to. I’ve spent a lot of time with Dr ifti and he had many stories and anecdotes to share. He is a consultant surgeon but his interests just start there. He reads a lot and he travels a lot – and he studies in detail anything that takes his eye. I am Irish and consider myself well read but he was even able to teach me a thing or two about the Irish famine – he has even travelled to Cobh in County Cork to see where the famine boats left from. He explained to us how the hospital would run when it is completed – he has a rota for staffing the hospital already. The consultants and junior doctors are already in place to travel from the UK at their own expense to have the hospital fully staffed but more importantly with good staff that can train the local doctors too. Dr Ifti will work in the hospital for two of his 5 weeks annual leave – he says 3 weeks holiday allocation for his family is enough. This won’t take into account the long weekends and various other visits he makes. Dr Ifti travelled in 2005 to help with the earthquake disaster operation – he did the same when the floods hit – he is not required to do this but he feels compelled. Dr ifti is happily married with two daughters and a son and he dotes upon his children. 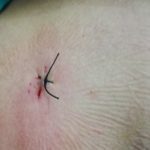 Now I want you to overestimate again what Dr ifti does – you will still have cut the rod too short! The hospital site is like any normal building site. I actually have a lot of experience of visiting sites as I am actually building a house in Spain at the moment and all unfinished sites are the same – a lot of concrete, a lot of steel rods sticking up out of the concrete and a site manager that actually doesn’t get his hands dirty but carries some plans and points to various things and what the future may hold.That’s the cynical side of me and yes you guessed it I have had problems on my site but this MDAUK hospital site was a fresh experience for me – things are going relatively smoothly – given the circumstances – this is an area where the earthquake has caused mayhem with the roads and transport links so given that background it gives a site manager a whole load of ready made lines and excuses to throw at you when needed. But this isn’t the case here – there are tiny glitches that won’t affect the end date of the project (given funding is in place!). And the construction so far is being done to a very high standard and will continue in this vain which will result in completion by June of next year of a good sized hospital in a much needed area. We returned to the hotel and rested for an hour before dinner. We were joined at dinner by two government officials. They had also popped by the MDAUK hospital site earlier. 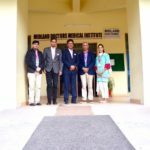 It is important to have these people on your side even when you are building something for free in the area they are involved with for various obvious reasons and Dr Iftkhar has a good manner by which he brings them into the fold but he remains apolitical and not influenced by them when it comes to the important decisions. Iftikhar Ali’s : The last few days has made us realise that food packs and handouts despite being necessary are not a sustainable solution. MDAUK have been working on adopting a village which would be rebuilt with input from the villagers thus empowering them to be self reliant. We went to see two villages one of which would be rebuilt using our donors’ money. The first village was surrounded by water and we had to cross a narrow walkway, part of which had been patched up a few hours earlier. These was a village of about 250 mud brick houses of which only 30 or so were still standing. The villagers were eager to tell their story however they seemed to be losing hope as one man said, “Lots of important people have been here taken notes and left, and we have seen nothing. We are far from the city, we have not been given rations, we have eaten what we have and now we forage for fish in the standing dirty water.” We saw many such makeshift fishermen standing waist deep in the burning sun. The second village was no different in the level of devastation but was bigger in size. We were met by a similar throng of people each person recounting their losses. The legal rights to land can be complex so it is vital for MDAUK to select the village location carefully to avoid disputes in the future. The villagers of Sindh vary from owning scraps of land on which they live and farm to the ‘Hari’ people, landless folk who live in mud houses on the landowners land and work the land in return for a wage. Bonded labour in one form or another is still alive. As we were leaving other villagers tugged at us, “Please come and look at our villages…” Fingers pointing this way and that, as we drove out a group from another village stood in front of our car begging us to see their village, men women and children all in a huddle, their pleas becoming more desperate as we moved on… One could sense the desperation turning to anger as our driver manoeuvred the car through. Once again we felt desperate to help them all but now had the knowledge that we would in fact only be helping a tiny minority.